I want to introduce you to the wonderful videos and photography of Steve O’Nions. Steve is a good friend of mine but he doesn’t know I have included this. Be sure to view his You Tube site and leave a comment. I know you will enjoy his photography. There is a new Discounts page for members on the Lenscraft website. There is also a great new offer from a very well-known Photographer of many years standing. My next book is in the final stages of (many of you will be able to receive this for free) together with a new accompanying video course. First though, I have a photography challenge for you. When you have been taking photographs for a few years, you tend to settle into a way of looking at the world and composing your images. If you have been shooting Landscapes, it’s likely you don’t give much thought to how you use depth of field in your photography other than to perhaps trying to maximise it. It probably became popular back in the days of Ansel Adams and the Group f/64 that we became obsessed with maximising depth of field when shooting landscapes. In this article, I would like to challenge you to think more about how you use depth of field in your photography. In particular, how you can incorporate shallow depth of field into your composition. Using depth of field as a compositional tool is probably going to gain greater importance as a way to set your work apart. Most photography that people now see has been captured using a mobile phone, where the depth of field is huge. In the future, we are going to see far fewer images using a shallow depth of field, simply because the small sensor camera phones can’t achieve it. Consider the following example image. 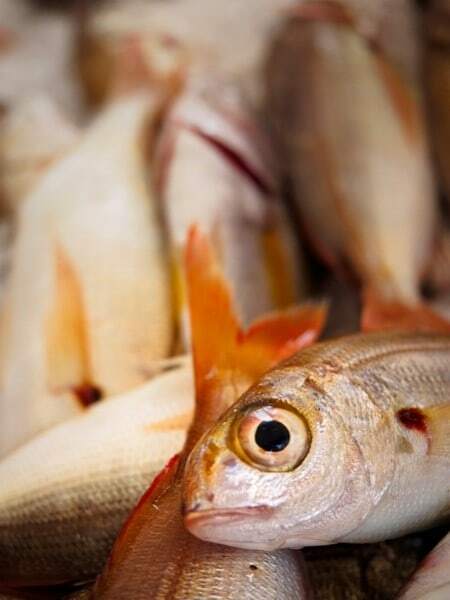 Here a shallow depth of field has been used with the point of focus placed on the eye of the fish. The rest of the image is then thrown out of focus, hiding the “background” which is a little cluttered and not as attractive as the foreground. It also retains the viewers’ attention helping prevent it from wandering back into the frame and out of the image. The shallow depth of field helps us direct the viewers’ attention onto a specific area. Coupled with this, I have applied a soft, subtle vignette in post processing which is also centred on the eye of the fish. Now consider what would happen if all the fish were in focus. This might cause the image to feel rather flat and two dimensional. There would also be different elements of the composition that would fight for attention. In the next example image a greater depth of field has been used to ensure all the fish appear in focus. Here the image appears much more two dimensional, but despite this still works. This is because the composition of the frame is flat. Had the camera been angled so that depth was introduced, having all the fish in focus would have created an image that appears to be much more confusing. It would have appeared to be a snapshot rather than a well composed, professional image. The aperture. The wider the aperture, the less the depth of field. For example, an image shot at f/2.8 will have less depth of field than one shot at f/18. With cheaper lenses, the maximum aperture tends to be smaller than with more expensive lenses. How close is the point of focus to the camera? Select a focus point 30cm from the camera and this will have much less depth of field than a point 30m away. If you want to achieve a shallow depth of field, get in close to and focus on your subject. The Focal Length of the lens. A longer lens will give the perception that the depth of field is shallower than a wide-angle lens. This is one of the reasons good portrait lenses tend to be short telephoto as they provide a nice working distance from the subject and allow the background to be blurred, Placing the attention on the subject. The sensor (or film) size. All other things being equal, a smaller sensor will achieve a greater depth of field than a full frame sensor. 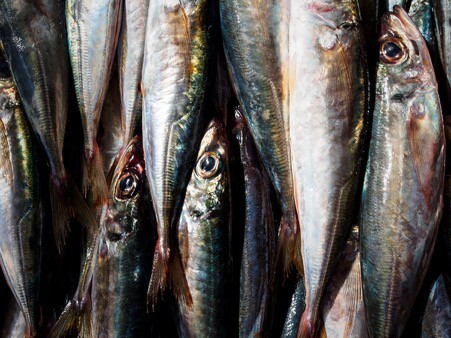 For example, the first fish image above was shot on a micro 43 camera, which has a smaller sensor allowing greater depth of field than a full frame camera. To achieve the required shallow depth of field it was necessary to use a long focal length, moved in very close to the fish and use the maximum aperture. Although you probably know these points, when was the last time you thought carefully about depth of field and especially how to compose with shallow depth of field? To use this technique properly it will demand careful focussing and a lot of thought about composition. How will you focus the viewers’ attention and avoid distraction? How will you work this into your composition? Can you apply shallow depth of field in Landscape Photography? Yes you can, although you might need to give it greater thought to how. Here are a couple of examples from my own work. 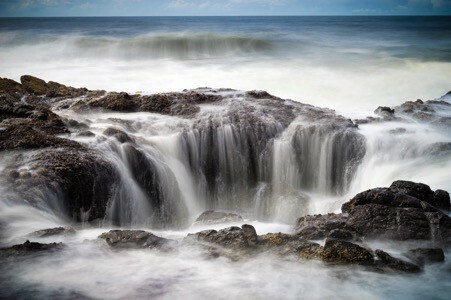 Thor's Well. Captured using a limited depth of field to throw the waves in the sea out of focus slightly, preventing distraction. Here a longer lens and moderate aperture were used with a full frame sensor camera. The intention was to focus on the blow hole in the foreground whilst reducing the detail in the distracting background waves. Leaf study using a shallow depth of field. 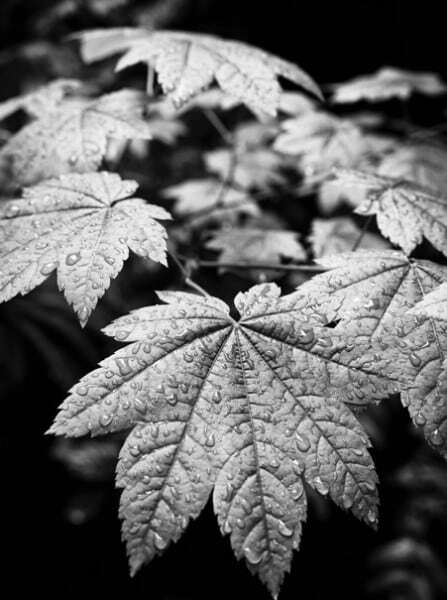 In this image, a shallow depth of field was used to retain the viewers’ attention on the foreground leaf covered in rain. The background is rather cluttered but you don’t realise this because the leaves are out of focus. If any of you take up this challenge, I would love to see your images. Post them on Flickr and drop me an email so I can take a look. I would like to introduce you to a good friend of mine Steve and his You Tube Channel. I have known Steve for some 10 or 11 years now and he is an excellent photographer. We try to get out for a shoot together at least once a month. More recently Steve has been filming and publishing his trips on You Tube and the results are great. It was also Steve who urged me to start videoing some of my trips. If you enjoy landscape photography I would urge you to watch some of his videos. I’m very excited by the discount offered above. It’s always been my intention to reward Lenscraft members with discounts on products offered both my myself and others. With a few discounts now available, I decided it would be a good idea to consolidate them into a single page in the Lenscraft membership area called Member Discounts. Any new discounts and offers will be added to this page as they are agreed so be sure to check regularly. 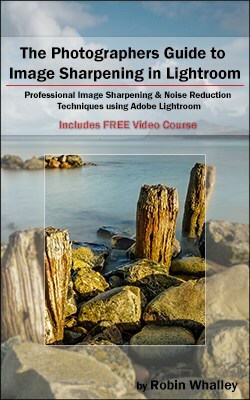 Finally, I would like to say a big thank you to all of you who have purchased my recent book “ The Photographers Guide to Sharpening in Lightroom” and/or accompanying video course. Both have received good feedback with people liking the combined approach. My next book will be a re-write of a previous book I have published “Viveza: The Secret to Creating Breathtaking Photography”. The new book is a ground up re-write of the old book with lots of new material. If you have already purchased this book, you will be able to download the new book from Amazon for free once it goes live. To accompany the book I am developing a video course along the lines of the Lightroom Sharpening course, and will be available on Lenscraft Training. Anyone purchasing the book will be able to purchase the video course at a substantial discount. There will also be an option for Lenscraft members to purchase the video course alone at a significant discount. I expect the new book and course to be available during April and will notify everyone by email when it is. Until then, all the best and keep the shutters clicking.